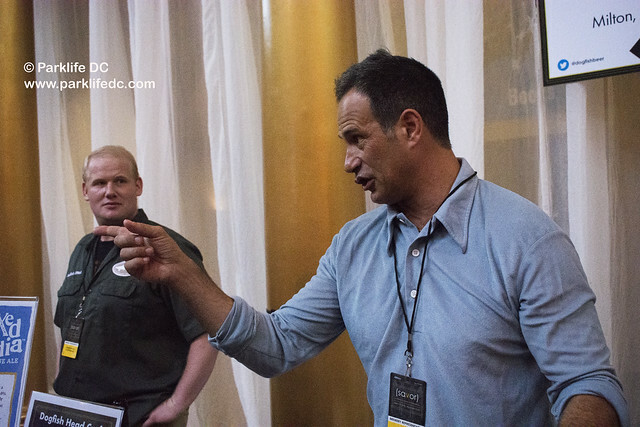 Posted on 10/25/2016 by Jeremy Bailey	in Around Town and tagged 7 Locks Brewing, Beer, beer festival, DC Beer Festival, food trucks, Nationals Park, Old Bust Head Brewing, Ruhlman Brewery, Tall Tales Brewery, Wild Wolf Brewing. It’s time to get excited about another beer festival! 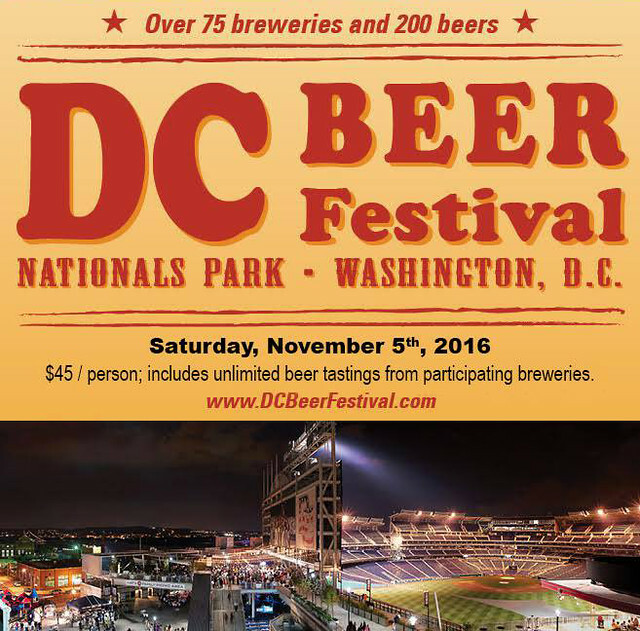 The DC Beer Festival returns to Nationals Park on Saturday, November 5th and you should be there. This year’s festival will feature 75 breweries and over 200 beers (probably enough options for you? ), and you can choose between two three-hour sessions (12-3pm or 5-8pm). Some of the local DC/MD/VA breweries I’ll be seeking to try for the first time include, 7 Locks Brewing (Maryland), Tall Tales Brewery (Maryland), Wild Wolf Brewing (Virginia), Ruhlman Brewery (Maryland) and Old Bust Head Brewing (Virginia). This festival will have a lot of local breweries plying their brews, the most they’ve ever had, including some of our favorite DC standbys like 3 Stars Brewing, Atlas Brew Works, Right Proper and Hellbender Brewery. From the limited list of beers on tap released so far, I’m looking at Ruhlman’s Holiday Brew, Stone’s Encore 6th Anniversary Porter and 3 Stars’ Nectar of the Bogs to definitely pour down my gullet. Food options include food trucks like Urban Poutine, Peruvian Brothers, Red Hook Lobster Pound, PhoWheels, Rio Churrasco, Balkanik Taste and more. There will also be games, DJs and you get to hang out in Nationals Park. Posted on 10/06/2016 by Jeremy Bailey	in Around Town, Food Talk and tagged Alewerks, Beer, Bluejacket, Festival, food, Heavy Seas Alehouse, history, Smithsonian, Smithsonian Food History Festival, The National Museum of American History. The Smithsonian hosts its annual Food History Festival on Saturday, October 29th at the National Museum of American History, while also offering other pre-events to get you in the mood. Plus an after hours beer event on ‘The Great History of American Brewing’. The Food History Gala: A seated dinner and fundraiser. Roundtables: A day of moderated discussions on the ‘politics’ of food and health. Dine Out: Afterwards, almost 30 restaurants in DC and VA will offer a special dish inspired by American food history. Learn more here. Food History Festival: Live demonstrations, talks, book signings and other ways to learn about food and its history in our country. 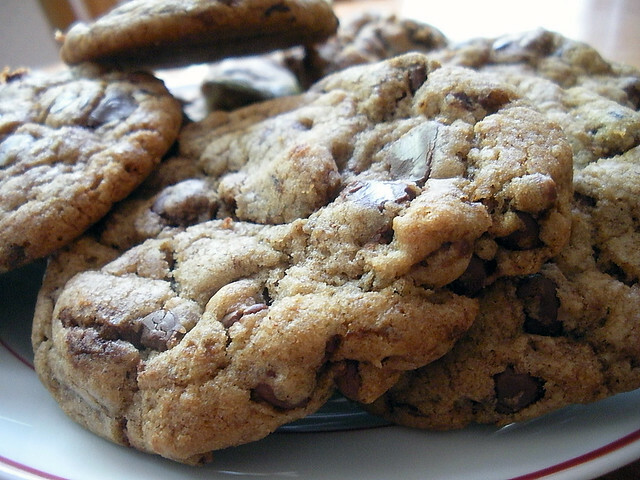 Find the full schedule of the Food History Festival here. The Great History of American Brewing ($40): Taste beers, try food and learn a bit of history over four historical tales. Breweries include Alewerks, Heavy Seas and Bluejacket, along with New Columbia Distillers. Get tickets here. Posted on 10/04/2016 by Jeremy Bailey	in Around Town, Food Talk and tagged Beer, food, food trucks, Pennsylvania Ave, Taste of DC, wine. 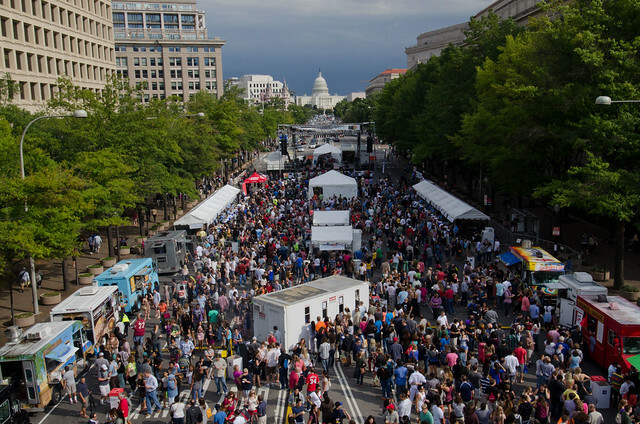 On October 8th and 9th, take a trek down to Pennsylvania Ave NW for the annual Taste of DC. The food options will be as diverse as you might want, from Croatian to BBQ to ice cream to Italian to Indian to Mexican to sushi to Turkish and beyond. There will be a Bier Garten with 50 beers. Five oz. tastes range from $2-4. You can choose from a few ticket options, from the basic $20 General Admission (includes drink voucher, $10 towards food) all the way up to the $60 Tastemaker (free drink samples, $25 voucher, special access, etc.). They also have the Tastemaker Plus that gives you access to behind the scenes sessions like women in the food industry or local distilleries, among others. 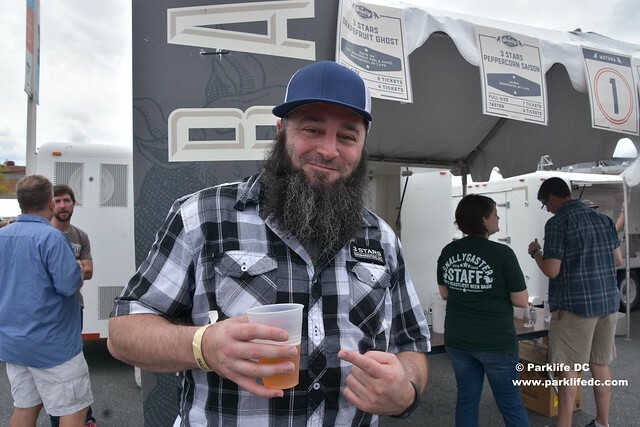 Posted on 09/16/2016 by Jeremy Bailey	in Around Town and tagged Avery Brewing Co., Beer, beer festival, pumpkin beer, saison, Snallygaster, Snallygaster 2016, Wicked Weed Brewing. Friends, Snallygaster is a mere day away! Start checking your notes, making your lists and cleansing your palette. Let’s look at a couple more beers we will be drinking. Perhaps the best block in all of Asheville, North Carolina encompasses 91 Biltmore Ave., where sits the Wicked Weed Brewing Pub. It’s an idyllic street to be sure, and the famous microbrewery sits next to The Orange Peel, Asheville’s answer to the 9:30 Club, adding to the appeal of the location. But lest I forget — those beers! Only this week on Sept. 12, Wicked Weed Brewing officially arrived in the DC metro market, going on sale at various bars around town. Well, they have arrived just in time for the Snallygaster, and while everything they do is good, I’m going to have to reacquaint myself with the Garçon de Ferme, the company’s 6.2% saison. They are quite well-regarded for their saisons down there in Asheville, and this one tastes like peaches and champagne with a big tart nose. Salut, mes amis! Ah, let’s take a peek at pumpkin beers! One thing I appreciate about Snallygaster, is that it signifies the beginning of autumn and the season when pumpkin beers start to appear in stores and on tap. I recently visited Colorado and had Avery Brewing Co. on my list of places to visit. Sadly, I didn’t make it that trip (but did find myself in many a brewery in Denver and elsewhere in Colorado). I like Avery’s porter and brown ale, and the sound of rum flavors mixed in with pumpkin (rum barrel-aged – hence Rumpkin) is too much to pass up. I’m not sure how the high ABV will affect the taste (usually I find 18% too much), but I’m willing to find out! Let’s be honest, I’ll probably also try Avery’s Pump(ky)n, an imperial porter with pumpkin spices, and any of the only (!!) 13 pumpkin beers available at Snallygaster. Make your own beer list. Posted on 09/15/2016 by Jeremy Bailey	in Around Town and tagged Beer, beer festival, District ChopHouse & Brewery, imperial stout, Lickinghole Creek Craft Brewery, oktoberfest beer, Snallygaster, Snallygaster 2016. Snallygaster 2016 is only two days away! Of the 351 beers to be poured at the beer festival on Saturday, September 17th, we continue to highlight a few for your enjoyment. Stay thirsty. With the approach of fall, it’s time for Oktoberfest beers. And while I don’t necessarily mean to stay local, District ChopHouse & Brewery makes a fine Oktoberfest. Indeed, I find this steakhouse and microbrewery to be quite underrated! I myself was disappointed for a bit when I discovered it was a chain, but I revisited my opinion after conversations with former assistant brewer Rob Fink (who has now departed for Jailbreak Brewing Co.), and I found the beers to generally be very fine stuff indeed. Balanced, clean, and malty, the Oktoberfest is one of many beers that the ChopHouse can be proud of. And I’m happy to drink it! For me, something dark and strong. Lickinghole Creek Craft Brewery is based in Virginia (on a farm far south of DC) and will pour a robust six beers at Snallygaster, all of which will be making their DC debut. Four of those beers are Imperial Stouts, so I need to try at least one, right? They all have high ABVs, so I may get a tad tipsy if I try them all. The Supreme Leader sounds the most delicious and promising. It’s bourbon barrel-aged with chocolate, vanilla, chili peppers and spices, and strong enough to knock you down. It’s among the top ten of all the beer options in ABV (Avery Rumpkin has the honor of being the strongest at 18.1%). Drink responsibly!